Home > Blog > How do you like your eggs in the morning? According to the song, it doesn’t matter whether they’re ‘boiled or fried’ or ‘up or down’, as long as there’s a kiss on the menu. Toast comes with a hug. And if you don’t get kisses and hugs then your day is ‘positively mayhem’. Well, I would have to agree, though sometimes I’d rather just have mine scrambled with a cup of tea on the side, never mind all this smoochin’. You may remember I mentioned I might be singing either this song or ‘Baby, it’s cold outside’ as a duet, part of a 1950s style set our group would be singing as part of the entertainment organised by Tulip Radio for Spalding’s Christmas lights switch-on. Despite more votes for the latter, Craig and I plumped for ‘Eggs’ as we were more familiar with the words and it was shorter, plus the backing track was in a better key for our voices. It seemed to go down well with the small crowd which had gathered in Spalding’s marketplace. Here’s Dean Martin and Helen O’Connell singing the original. We sounded just like them…honest! 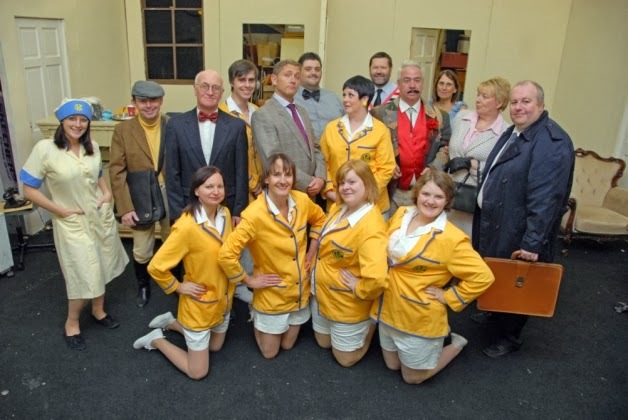 With our production of Hi-de-Hi opening on Wednesday, this was the ideal opportunity to provide a little bit of publicity for the show. Several members of the choir are also in the play so were able to wear costumes. To stave off the cold, I had two pairs of Pretty Polly Nylons on under my white shorts, plus little white socks and plimsolls. Thankfully the weather was kind to us – no breeze to speak of! A vest and a cardi under my ‘yellowcoat’ blazer seemed to do the trick too. We sang for about 45 minutes – including some Elvis, Buddy Holly, Frank Sinatra and the Everly Brothers – and I think we did ourselves proud. My toes were just about turning blue when we finished, ready to hand the mics over to the school choir competition and dash home to put the tea on. Back out at 6pm to ‘get in’ to the theatre with costumes and have a run-through of the play for the first time on stage. One of the big advantages of having a small part in a play, as opposed to playing Mrs Overall in Acorn Antiques earlier this year, is the reduction in stress levels. I’m still very tired, as we rehearsed a lot last week and since Sunday I’ve been coming home from the theatre at 10.30pm every night, a pattern which will continue until Saturday night, but there isn’t that sick-to-the-stomach panic which normally accompanies the routine. Instead I go into make-up (lots of sparkly blue eye-shadow) then put my costume on, which stays on for the whole show: no changes. Once my wig is firmly in place, and my own brown hair tucked away as best as I can (if it peeps through I can always say that Sylvia’s roots are showing again) then I can settle down in the dressing room, make a cup of tea, and breathe. Anita, who plays the role of Ted’s wife, sits next to me and, as she doesn’t have many scenes either, has brought her school marking with her. I’m supping tea and chomping on a bar of Fruit and Nut (no singing to do so no fear of the chocolate affecting my voice) and she’s measuring sides of a triangle. Disadvantages? When you have a main part in the show, you have a dressing room just behind the stage. Supporting roles have to go upstairs to the other dressing rooms. Darling, I’m not used to slumming it! Stairs? Me? Do they know who I am? 😉 I’ve still got a crackly knee since playing Mrs Overall: months later and it still sounds dreadful when I have to go up and down stairs. Thankfully no pain but I suspect arthritis will set in before long and then it will be a case of life imitating art. Going from playing a cleaner with a hump and a hairnet, to a young (!) holiday camp entertainer in skimpy shorts and bright red lipstick, is quite refreshing. Only half a dozen lines but I’m on stage a fair bit just nodding, pretending to drink coffee and champagne and, if in doubt, saying ‘Ho-de-Ho’ every so often. Nice and easy. The rest of the cast are brilliant, all perfect in their roles. If you live near Spalding and fancy coming along to see Jeffrey Fairbrother, Gladys, Peggy, Ted, Spike, Mr Partridge etc, we’re at the South Holland Centre from tomorrow night (Wednesday) through to Saturday 23 November. Tickets are £12 (£10 concessions). The photo below was in our local paper last week. We didn’t all have full costumes and wigs at the time the photo was taken but it will give you a flavour of what we have to offer. 2 pairs of nylons and a vest?! The reality of being a star just doesn't match up to the media image does it! next you'll be telling me that Madonna wears spanx. So sorry to shatter your illusions. I'm sure she does – has the added benefit of keeping the kidneys warm. Chondromalacia patella probably. In the knee that is. I've had it in the right for years and now my left knee is even worse. I sound like a bag of spoons when I walk up stairs although it's not really painful. Dodgy knees must run (or walk slowly, while creaking) in the family! That diagnosis sounds familiar – Dougie examines my knee every so often when I whinge about it and mutters something about wear and tear at the back of kneecap. Mine isn't painful either, which is a relief. can imagine it's like living with a plumber. Taps drip constantly for years, it's only when the pipes finally give way completely that they sort it out. Not that I'm implying there is anything wrong with your pipes! Well lagged in a vest and multiple nylons! I'll have you know my pipes are in good working order – I've signed up for the five star service with Dougie's Direct Debit. You all look terrific in the photo, very professional with the right costumes and everything. I'm sure the audience will love the show. Just published a photo on FB with me in my blonde wig. It's frightening. But you're right, everyone looks the part. Opening night tonight! Have been pretending during rehearsals but last night we had proper booze for the dress rehearsal. Cheap plonk but welcome all the same. What a trouper you are! good on'yer girl. The smell of the greasepaint – I love it! Did I press publish that comment? did I? thought I did…can't remember….am I going crazy…..never mind me Trish..having a moment…..well done on the show! Yes you did! See above! No, you're not going crazy. I have comment moderation on to sift out the spam so it can often look as if a comment has disappeared. I'll take a full breakfast to go, please! You guys look fantastic!!! You always seem to be having so much fun Trish, jolly good on you. We got loads of those shows in NZ and they are very dear to me! PS canary yellow suits you chook! It's funny how the memories of the TV programme come flooding back. Seems like only yesterday I used to watch it. I never thought of myself as suiting yellow but maybe I should rethink my wardrobe. I have to wear a hairnet under my wig but yes, rather nice to be without the hump….and the varicose veined tights! Ooh! Break a leg (though not a knee cap!). And pretending to drink champagne is a waste! Make them give you real stuff…. We got proper bubbles last night – far better than an empty glass. We are a useless lot – we never remember to place someone in the audience with a video camera to record us. I would have liked to hear it too! Britmums!!! Oh my god…I'd have to be inebriated.